I can't explain why total strangers ask for my nutritional advice, but they do. It mostly happens near the kale. I LOVE this picture because while this was her reaction, she actually likes them. She just wasn't expecting the texture/taste. Any time I make a batch she's one of the littles mowing down with me. You don't really need a recipe to make kale chips, but a little instruction can be helpful. I will pass along my trials and errors and hopefully you won't have to go through them. There are quite a few different kinds of kale, so don't be intimidated when you see it at the store. I haven't found a big difference in taste, and they are all equally simple to prepare - so pick whichever one strikes your fancy. Buy all of them and try each one for yourself! Kale is the same as any other fresh veg: you want to avoid brown spots, limp leaves and rubbery feeling plants. Fresh kale will be found in the wet aisle of the grocery store, where you get sprayed if you hang out singing show tunes for too long. Or whistling them - the sprayer doesn't discriminate. This is my only little person who just doesn't love kale chips. He's tried them with salt, nutritional yeast, sprayed with soy sauce, and with Oh She Glow's "All Dressed" recipe and just can't get into them. Cutting the kale is great occupational therapy for his hands though, so he still helps me make them. I like to prep veggies as soon as I get them home so they are more convenient to eat. I especially like prepping kale in advance so it has a good chance to dry out before baking. Prepping is simple. Remove leaves from stem (the stem is like a tree twig it's so chewy) and cut or tear into small pieces. I'd say a 2 inch square, but sometimes the pieces are smaller because of the shape of the kale. If you have a salad spinner - rinse the kale and spin it. I use a colander and rinse the kale and toss it in the colander over the sink to drain excess liquid. 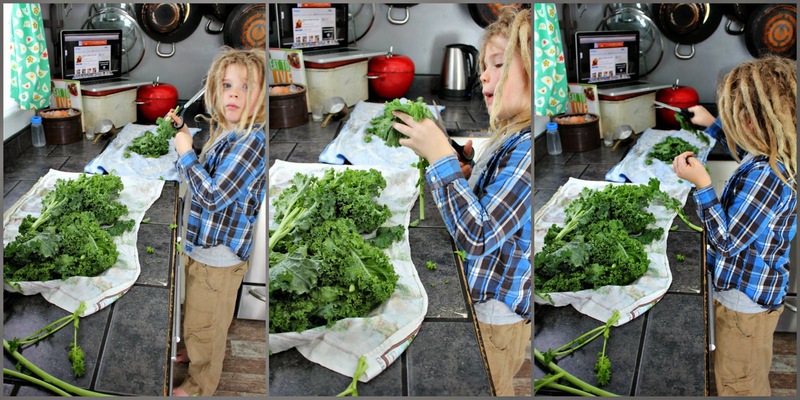 Dump kale onto clean dishtowel and roll up. You can leave the kale in the fridge like this for a few days and it will stay fresh and crisp. Personally, when I know there is kale in the fridge it never lasts a few days - I just can't wait to eat it. Low and slow is how you want to bake these, so preheat your oven to 300. What I love about kale chips is that you really only need 1tsp (2 TOPS) of oil to coat a whole head of kale. Put the clean and dry kale in a big bowl and add 1tsp of your favourite oil. I am addicted to nut oils and have been using walnut - but anything will do: avocado, olive, coconut - use what you've got. You'll need to put your hands in the bowl to really get the leaves coated. I tried tossing it a few times but it really just doesn't get the job done. Stick your hands in - it's just oil. Once the leaves are all coated, lay them on a cookie sheet lined with parchment paper. It may seem like a pain in the tooshie - but use two cookie sheets and give those little pieces of kale lots of space. You don't want them layered on top of each other or you'll have soggy or burnt chips and that's not tasty. After the kale is spread out evenly on the cookie trays pop into the oven for 15 minutes, rotate the pans and stick in for another 10 (25 minutes total). I've found the curlier kale can take up to 35 minutes - so when you take it out of the oven just quickly eat a piece to see if it's dried out or not. It cools almost instantly so there is no mouth burning possibilities. If it's not quite dry pop back in the oven and keep a close eye on it, putting back in for 2 minute increments until perfect. Once the chips are done baking, let them cool for a minute or two on the tray. This is when I like to season mine. I have tried many kale chip recipes but my favourite is plain old salt. When the chips are cool, pour into a bowl and I dare you not to eat every last bit. If you have leftovers put them in an airtight container and eat within 2 days. Seriously though, who has leftovers? 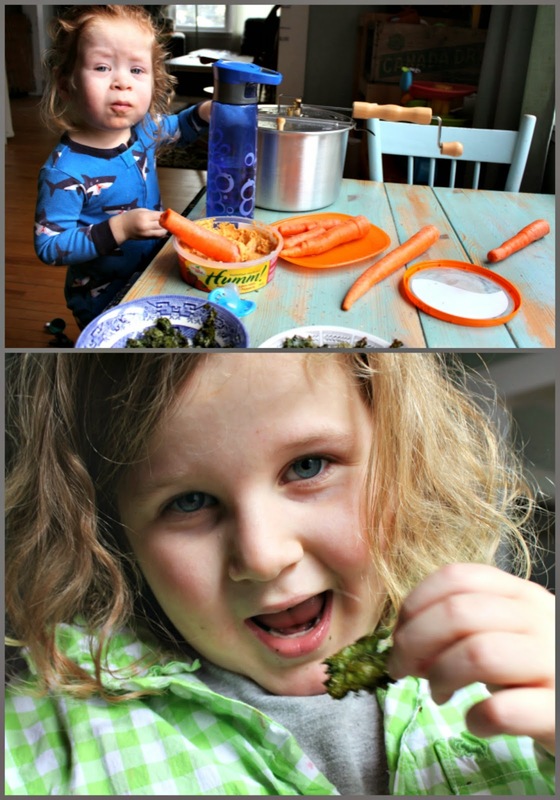 These two little people are equally as addicted to kale chips as I am. I have to bake 3-4 heads of kale to satisfy the family. I also just love the super serious face I'm getting in the top pic. He puts food in the whirly pop, mixes it up and eats it afterward. I swear he does it so it's like he's made it and not me. He's bossy like that. 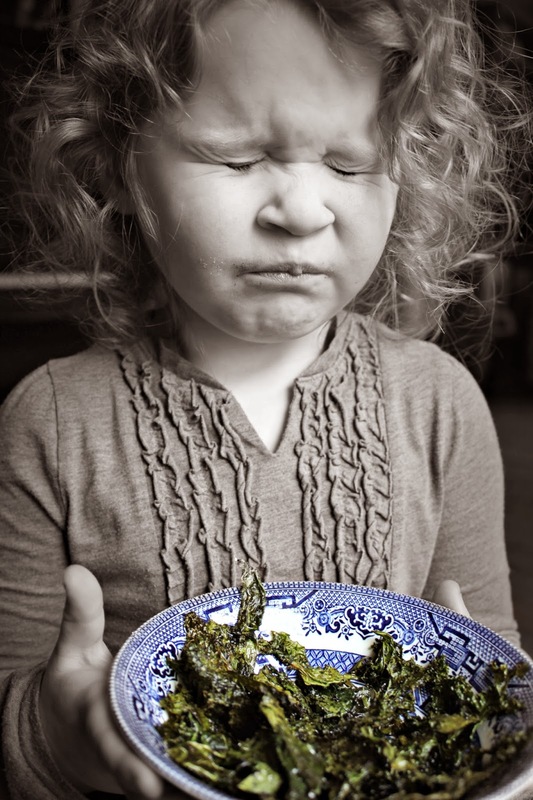 When I first tried kale chips I thought "what a rip off!" They were not chips. They were crunchy pieces of salad with salt on them. I think the word "chips" is what throws a lot of newbies off. I tried a handful (I'm an all or nothing girl) and my face mimicked the face of my daughter in the above picture - but as soon as I was done eating that first handful I just had to have more. It's true. Soon enough the whole bowl was gone and I had eaten an entire head of kale. I'm sure pigging out on anything isn't really healthy, but I don't ever feel bad when I've pigged out on a monstrous amount of kale. So... try it, I know you'll love it - just don't expect it to be a chip replacement. If you're looking for more tips on kale chips, I found this article to be really helpful. Happy Baking! Well if I like them - everyone should like them! From plain potatoes and rice to kale chips - who would have thought? I guess 20 years makes a difference in palate.